What is Exempt from Debt Collection? IMPORTANT NOTE: The exemptions from debt collection discussed on this page apply to private debts like credit cards, medical bills, and bank loans. If you have child support debt, or if you owe money to the government for taxes or a student loan, different rules apply. What does it mean to be exempt from debt collection? Under state and federal law, certain kinds of income and property are classified as exempt from debt collection. A creditor or debt collector cannot force you to use exempt income or property to pay a debt. What kinds of benefits are exempt from debt collection? What kinds of retirement funds are exempt from debt collection? How much earned income is exempt from debt collection? If you receive PA or SSI, all of your earned income is exempt from debt collection. Earned income up to 30 times the minimum wage per week, after taxes, is exempt. The minimum wage is currently $15.00 an hour. If you take home $450.00* per week or less, all of your earned income is exempt from debt collection. If you take home more than $450.00* per week, 90% of your gross income or 75% of your disposable income, whichever is greater, is exempt from debt collection. *This amount is based on the $15/hour NYS minimum wage for “NYC – Large Employers (of 11 or more),” effective 12/31/18, as listed on the NYS Department of Labor’s website. This amount may vary depending on the specific NYS minimum wage applicable to your location and employer. 90% of income earned within the last 60 days is exempt from debt collection. If you have a frozen bank account, and all the money in the account is from recent paychecks, odds are it is all exempt from debt collection. Can my personal property be seized by a Marshal? One television, one radio, one computer and one cell phone. Items that you need for work, “tools of the trade,” not exceeding $3,000 in value. Can the Marshal seize my car to pay a private debt? Yes, but only if your equity in the car is greater than $4,000. If you still owe money on the car, it is likely to be completely exempt from debt collection. For example, if your car is worth $10,000 but you still owe $8,000, your car would be completely exempt from debt collection. Cars that have been equipped for use by people with disabilities are exempt up to $10,000. What if I have personal property that is not exempt? Don’t worry. For most low-income people, a threat to seize personal property is an empty threat. At New Economy Project, we have talked to hundreds, if not thousands, of low income New Yorkers. None of them have ever had property seized by the Marshal. For various reasons, it simply does not happen in New York. As long as you do not have valuable property — such as expensive paintings, furniture, jewelry, and other luxury goods that would fetch a good price at auction — you have nothing to worry about. Can a debt collector take my exempt income or property if it has a judgment against me? No. If you have exempt income or property, a debt collector cannot take it to pay a debt, even if it has a judgment against you. That being said, judgments have other negative consequences, and it is best to avoid them if possible. What does it mean to be “judgment proof”? If your income consists only of the exempt funds mentioned above, and you have no assets, some people would call you “judgment proof.” This means that your creditors cannot collect money from you — even if they have a judgment — because all of your income and property is exempt. It is important to understand that a court can still enter a judgment against you, even if you are considered “judgment proof.” If that happens, you will not have to pay the judgment so long as your income remains exempt from collection. However, if your situation changes (for example, if you return to paid employment or win the lottery) you will have to pay the judgment from your non-exempt funds. How can I keep my exempt income safe from debt collection? First, if a debt collector contacts you about a debt that you cannot or do not want to pay, you should send a cease letter instructing the debt collector not to contact you anymore and explaining that your income is exempt from debt collection. You can use this sample cease letter for people with exempt income(PDF) as a model. Second, you might want to send a letter to your bank stating that your account contains exempt funds that should not be restrained. You can use this sample letter to a bank regarding exempt income(PDF) as a model. Third, if you receive a summons telling you to come to court, do not ignore it. 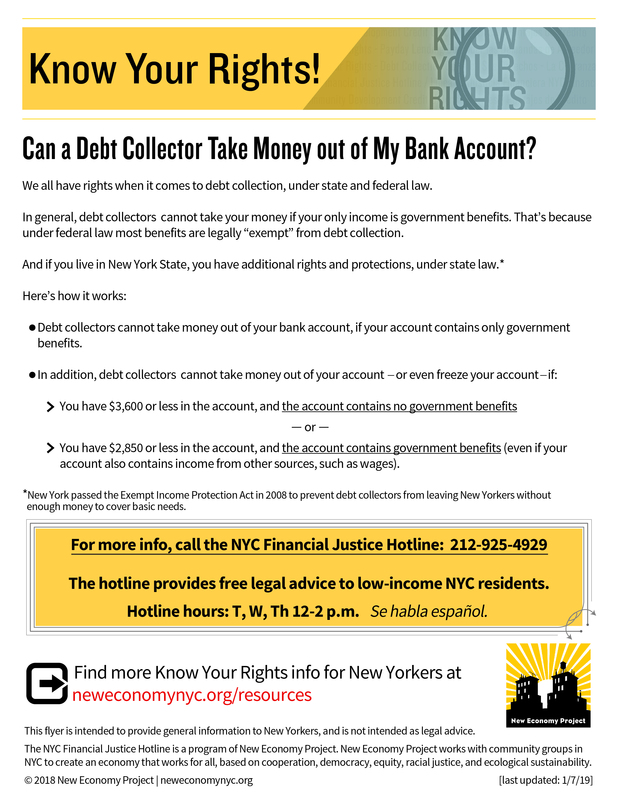 Call the NYC Financial Justice Hotline at 212-925-4929 for advice about how to respond to the summons. Is my exempt income safe in a bank account? Even if a debt collector has obtained a judgment against you, your exempt income is still protected even after it has been deposited in a bank account. The best way to protect your exempt benefits is to sign up for direct deposit and keep your bank balance below $2,850. The best way to protect your earned income is to keep your bank balance below $3,600. See here for more information. If your bank account consists of only exempt funds and has been frozen due to a court judgment, call the debt collector and ask that your account be released immediately. Exempt income is always protected from debt collection, even if there is a judgment. If you need help getting your exempt funds released, call the NYC Financial Justice Hotline at 212-925-4929. Is my tax refund exempt from debt collection? No, tax refunds are not exempt from debt collection. Disclaimer: This site provides general information for consumers and links to other sources of information. This site does not provide legal advice, which you can only get from an attorney. New Economy Project has no control over the information on linked sites. Copyright ©2007 by the Neighborhood Economic Development Advocacy Project, Inc.